An almost timeless, splendid tranquil scene, you can see the lush grapes as painted ‘plien aire’, you can almost feel the heat of that day the artist produced this landscape painting of Château Ausone. 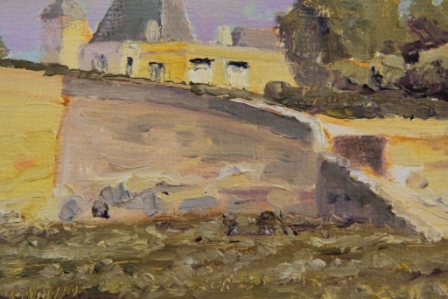 This scene was painted on location from the roadside; today the scene is little changed, you could stand on the very spot the artist worked from. Situated a few hundred meters South West of the town’s medieval walls, Château Ausone is planted on the deep limestone bedrock that has been the raw source of the town. The wines of Château Ausone are considered typical and among the very finest St Emilion has to offer the connoisseur. Curiously the original artists sketched in red (Gordon Frickers used yellow ochre) then also painted with great spontaneity. 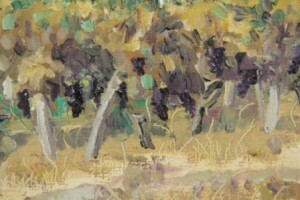 Additionally, examples of their technique can be found in English work of the period, further linking the modern work with the ancient. Chosen as a subject by happy chance, it is fitting that it in turn has become part of this historic 21st century painting record & project. The distinctive roof of this chapelle is one of the dominant features of this paintings skyline. This chapelle of great antiquity is noted for its paintings which are of surprisingly complex iconography. Some of the paintings probably date back to the early 13th century when the chapelle was commenced, with subsequent additions mostly in the 14th century, a period of intense pictorial activity in Saint Emilion. The Château Ausone estate occupies a prime site overlooking the Dordogne Valley and besides superb wines, it is particularly noted for its ancient chapelle. 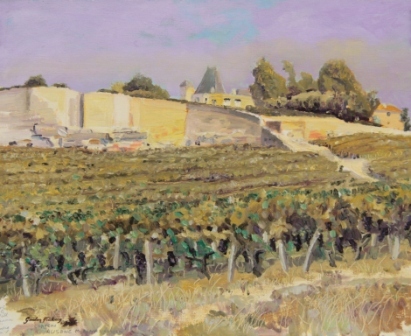 Château Ausone, one of the most ancient properties offering some of the finest wines at St Emilion has an interesting history which includes, it was painted by Gordon Frickers !